It is time to plant your fruit trees if you want them to get established before the hot weather comes. If you order from a northern nursery though, they won't send the trees while there is still a danger of the shipment getting frozen, so try to find nurseries closer to home that can safely ship early. There are many kinds of fruit trees that will do well in Central Texas. Apples, apricots, figs, pears, peaches, plums, nectarines, and pomegranates are some common ones that all can be grown here, but you must do your research before you buy. Find out which varieties of fruit trees will still set fruit with 500 or less chill hours. Chill hours is the average number of hours below 45 F that your area will receive between November to mid February. College Station receives about 500 chill hours annually. If you want to be precise you can go to your local county agent and ask her or him, or look for records of the low temperatures of the past several years and figure it out yourself. Another thing to consider is what diseases are a problem here and look for varieties that are most resistant against those. Many people grow pomegranates, nectarines, peaches and figs here in backyard orchards, and there are a lot of choices. There is a chill factor for peaches, nectarines, and apricots if you live below San Antonio, and many people don't know that some varieties of peaches and nectarines might not get enough chilling here in Texas to set fruit. (Actually, nectarines are just a fuzzless peach, and are treated just the same.) It is too far south to grow apricots around San Antonio, but they can be grown around Taylor. The main consideration in picking out a variety of these fruit trees for our area in Central Texas is that some newer varieties are more disease resistant, and will need less spraying. 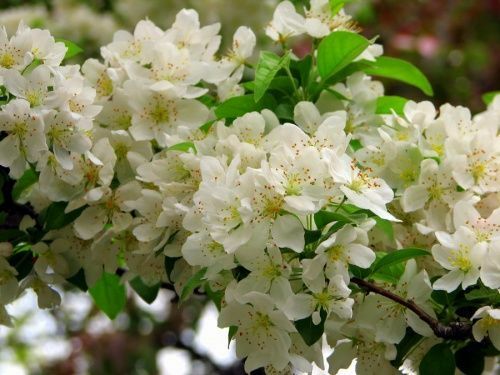 Also, very importantly, some bloom later than others and are more likely to escape frost from damaging the flowers and destroying that summer's crop. This is especially a problem with us growing apricots. None are carefree, however, and don't expect a lot of beautiful fruit unless you want to invest some time into your fruit trees pruning, spraying, fertilizing, and watering during a drought. Peach trees are a very beautiful ornamental tree, and if you just want them for their flowers, there is nothing wrong with that! Apricot trees are a naturally dwarf tree that are drought resistant, and get fewer diseases than peach trees. There are several Chinese varieties grown for their sweet pits, which are eaten like almonds, but regular apricot pits are very poisonous. You must be more choosy with apples, pears, and plums if you hope for a lot of fruit, for most of these require more chilling hours than we get in Central Texas. 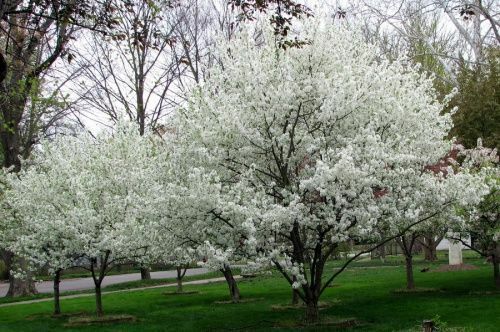 First, choose varieties that are standard full size trees. Dwarf and semi-dwarf trees do not have a deep enough root system to withstand our long dry summers and high winds. If they don't wilt from the heat, they'll blow over! Next look for varieties that need 500 or less chill hours to produce fruit. Japanese plums do best here. The European varieties, especially the Gage type need more down-time in the cold. Pears are tricky. Their chill requirements are all over the place, as are the apples. There are two main factors in considering these trees; one is resistance to fire blight and/or cedar rust, and the other is low chill hours. If you can match up these two requirements, then you probably have a winner. Don't forget to consider crab apples, for they are beautiful with white, pink, or red flowers, and many have apples large enough to make beautiful jelly, or you can just share them with the birds and wildlife. 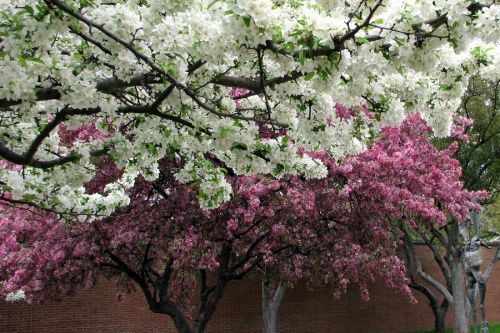 They are messy when the fruit rots on the ground, so don't plant them near paths or sidewalks. If you buy fruit trees in pots, you must cut the roots that twine around the pot in a circle, for the roots will continue to grow that way and strangle itself. Neatly cut any roots that get torn, and straighten them out as best you can. Mound some dirt beneath them in the hole and spread the roots outs like spokes in a wheel. Don't fill in the hole with potting soil if you dirt is clay because the clay will act like a great big flower pot without a drainage hole! The potting soil will absorb a whole lot of water from the next rain, which won't readily drain out, and it will sour and suffocate your trees. Fruit trees also need to be planted in full sun where they get plenty of breeze to help prevent mildew and fungus from growing, so don't plant them too close together, near larger trees, or next to your house. All fruit trees benefit from a thick mulch to help amend the soil, hold water, cool the roots, and prevent weeds. Think of planting fruit trees as a long term investment. If you buy the right varieties suited for your climate, plant them in a good spot, and take care of them, you will certainly enjoy fruit trees for as long as you live there. It is possible that your grandchildren will still be enjoying your trees someday! Next time, there will be more on growing pears and apples in Central Texas.